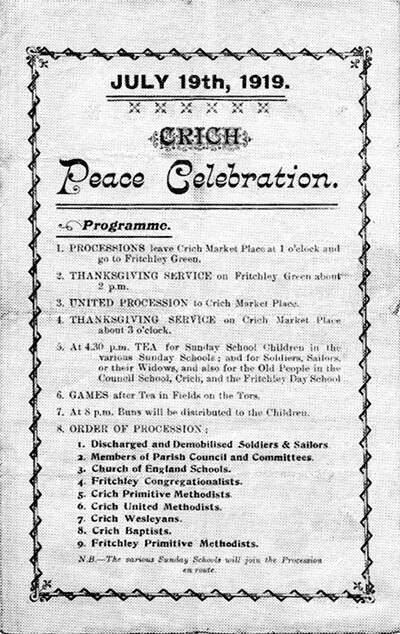 Peace celebrations were discussed by Crich Parish Council on Monday. It was decided that not exceeding 2d in the £ be taken from the rates. Messrs FJ Lynam, JR Smith and G Lander voted for, Mr PS Smith against and Messrs J Bowmer, A Rowland and E Ashman neutral. It was agreed to give tea to all under 14 and over 60 and to sailors, soldiers and their wives or dependents. The question of a bonfire on the Cliffe was deferred until Wednesday, when a further meeting was held, investigations are being extended to the various bodies in the parish to send representatives. 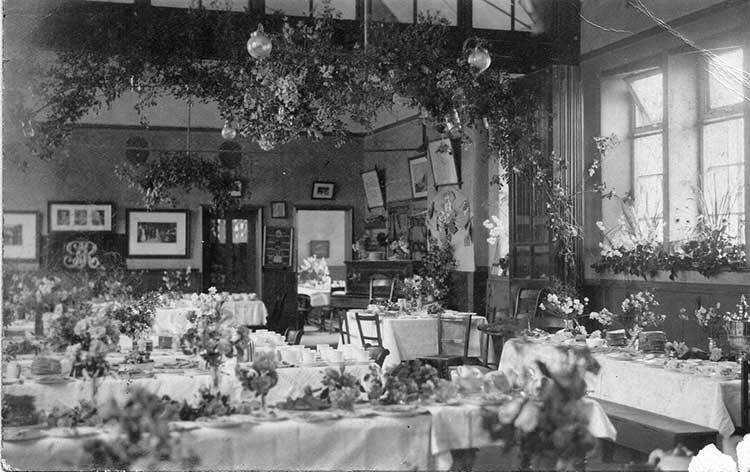 Various Sunday schools committees were appointed to provide tea for their scholars, whilst the elderly people of Crich, together with the members of the forces, are to have tea at the Council School, the Red Cross Committee Knitting Guild, and Parcels Committee to carry out the catering. The old people of Fritchley and Wheatcroft will be entertained at their respective places. Crich Silver Bands tender was accepted. It was decided to have a display of fireworks, the question of a bonfire was left until more of the Crich lads have returned. Mr Ashton’s offer of two fields on the Tors for games etc was accepted, the firework display to be held there. Arrangement for the procession were delegated to members from the respective bodies of the parish. Crich celebrations were a great success in every way. The procession established a record with regard to numbers and appearance. It started from the Market Place at one o’clock, headed by the Crich United Silver Band, under the conductorship of Mr Sam Hollingsworth, and proceeded to Fritchley Green, where a thanksgiving service was held, the address was given by the vicar (the Rev RO Wilson, MA). The processionists then went as far as Town End, returning to the Market Place, where another thanksgiving service was held, the address being given by Dr GG McDonald, JP, who afterwards proposed a hearty vote of thanks to the Parish Council, the Red Cross Society, Knitting Guild, and all others who assisted. Mr F J Lynam, chairman of the Council, suitably responded. In the procession the various local bodies were represented in the following order: – about 100 discharged soldiers and sailors, most of them in uniform, Parish Council, Church of England Schools, Fritchley Congregationalists, Crich Primitive Methodist, Crich United Methodists, Crich Wesleyan, Crich Baptists and Fritchley Primitive Methodist. Tea was provided at the council school for children soldiers, sailors or their widows, old people, and others. Amongst the ladies who presided were Mrs McDonald, Mrs Deacon and Mrs Dunn, and various Sunday schools and at the Fritchley Congregational school. Amongst the ladies who presided were Mrs Hamilton and Mrs Slack, by the kindness of Mr FJ Lynam a motor conveyance was at the service of the guests in coming from and returning to their homes. 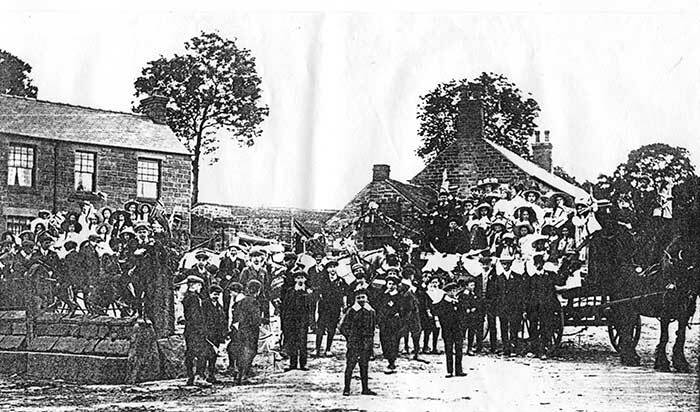 Whatstandwell section of Crich Parish held celebrations on their own account. A public procession comprising soldiers, sailors, airmen, day and Sunday schools, decorated conveyances, cycles, mail carts, and competitors in fancy dress, headed by Whatstandwell Brass Band, paraded the village from the Derwent Bridge to Chase Cliffs. The people of Crich, who throughout the Great War have displayed unswerving loyalty and patriotism, had an enjoyable time on Saturday. 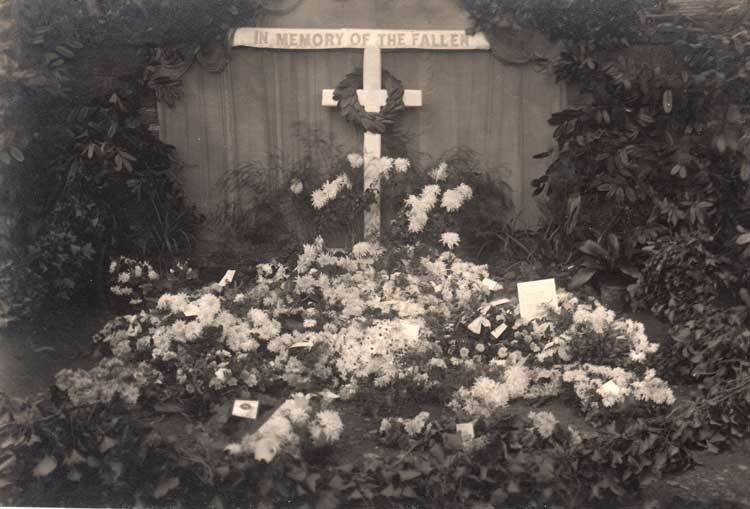 In connection with the Crich branch of the Comrades of the Great War garden party and fete took place in the grounds of Chase Cliffe, by kind permission of Mr and Mrs Maurice Deacon. The programme included sports, sideshows, dancing, etc. The Crich United Silver Band, under the conductorship of Mr Samuel Hollingsworth, was in attendance and provided excellent music. 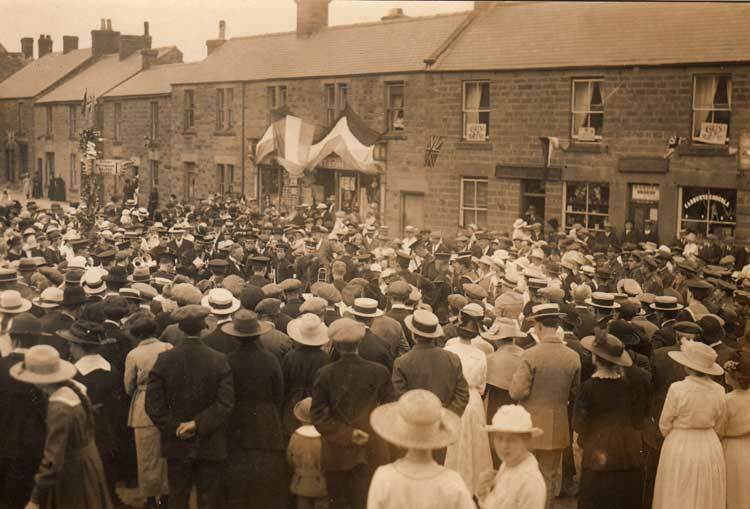 Earlier in the afternoon the band paraded Crich and Fritchley for the purpose of flags being sold en route by the following young ladies: Miss Eva Ashley, Vera Bingham, Muriel Brown, Frances Dawes, Gertie Frost, Doris Greenhough, Audrey Knowles, Freda Lynam, Flora Mason, Mary Mason, Ruth Perry, and Rose Smith. The weather conditions were ideal, and the fete was in every way an immense success, for which credit is due to the local Comrades and their energetic honorary secretary, Mr W T E Curzon. A Comrades tennis tournament was held, Mr J T Smith being the judge. The judges for the sport were the Rev R Ord Wilson, M.A. and Mr Newman, the handicappers being Messrs JW Dawes and J Wyles. Refreshments were provided by a ladies committee organised by Mrs Payne. Mrs Deacon presented the prizes the following being the winners: Girls 80 yards flat race: Irma Brown,1; Barbara Stiles, 2. Girls flag race: G Frost, 1; M Mason, 2. Tennis Tournament: Mr S Taylor and Miss M Haynes. Boys under 14 years 80 yards flat race: H Allsop 1; F Dawes 2 . Girls skipping race, 80 yards: Irma Brown, 1; E Hall, 2,. Boys under 14 years sack race: E Holden, 1; F Dawes, 2. Three legged race: H Alsop and Irma Brown. Treacle bun competition: Mr J Goodall. Donkey race: Messrs W Curzon and W Olliphant. Bowling out wicket: Mr Jas Adkin, 1; Mr B Dixon, 2. Prize for flag selling: Miss Rose Smith. An important feature was the presentation by Mr Deacon of the military medal to Mr W Coleman, late RFA. Mr Deacon said he had much pleasure in presenting the medal to Signaller Coleman, which had been awarded for bravery in the field. He was confident they would all join with him in congratulating the recipient in gaining this great distinction, which he had earned by his devotion to duty. They must not forget that Signaller Coleman, amongst others were joined from Crich had been fighting for King and country, and that their thanks were due to such men for the brave way in which they carried out their duty and for the results which had accrued. From Crich no less than 369 men joined the forces and taken part one way or another in the war. Mr Deacon recall the fact that five years ago they held a meeting at Crich, when he amongst others impressed upon the younger men their duty to take part in the defence of the country against Germany and the other enemies. Millions of lives had been lost, but the allies had been absolutely successful. Mr Deacon hoped they will show their thanks for the winning of the war by putting their efforts into the work of reconstruction of the country in order that it may soon be restored to its normal prosperity. This country would not be bought to that state without the united devotion to work of all. Let them take an example from the way in which the men of Crich had risked their lives. Let them do likewise – to help England back to the premier position in the commerce of the world. America was a keen rival, and soon they would have Germany with the cleverness once more as a competitor. Mr Deacon then pinned the military medal to Signaller Coleman’s coat and in this pleasurable task he was assisted by Mrs Deacon. Mr Coleman suitably returned thanks and said he had only done his duty. Mr J Payne, commandant and chairman of Crich branch of the Comrades, proposed a vote of thanks to Mr and Mrs Deacon for their kindness, and this was carried amid much cheering. Saturday was memorable day for Crich. The welcome given to the men returned from the war was one of right royal character. It was an ideal day and large crowds turned out to participate in the event. The proceedings began with the general assemblage in the Market Place. A procession was formed with Driver Edward Coleman at the head as mounted standard bearer, and police-sgt R Holmes, pc J L Parkes and ex-police sergeant J Wyles as marshals. 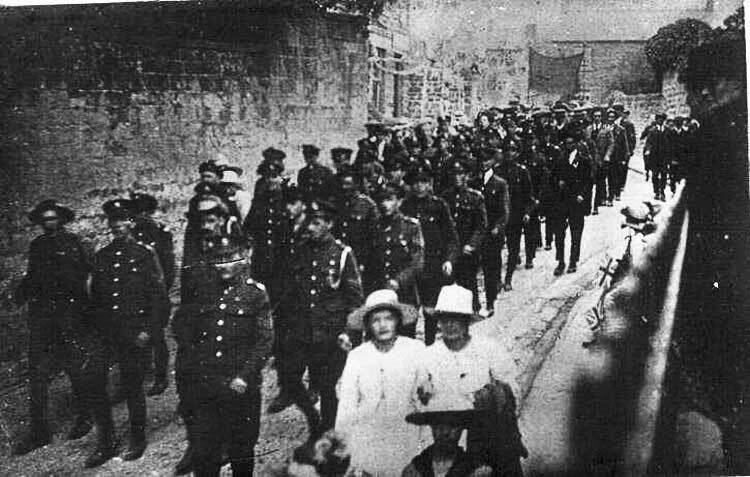 About 300 ex-service men with ex-Lieut H England in command followed, marching to the strains of the Crich United Silver Prize Band, who gave their services during the day. Members of the Parish Council with chairman Mr J L Lynam (mounted), and members of the various local bodies also joined in the procession, which moved on to Fritchley and then returned to the Market Place, marching past the Cenotaph erected to the memory of the 60 men the parish who had fallen. The monument was designed and erected by Miss Allen.